The market followed through on last week’s big bullish move, with the S&P 500 tacking on a 1.09% gain on Monday. But between yesterday’s opening gap and now the sheer size of the move from the low made two weeks ago, stocks are vulnerable to at least a little profit-taking. Advanced Micro Devices (NASDAQ:AMD) did most of the heavy lifting, gaining 11.3% mostly in response to what seems like a trade war truce between China and the United States. 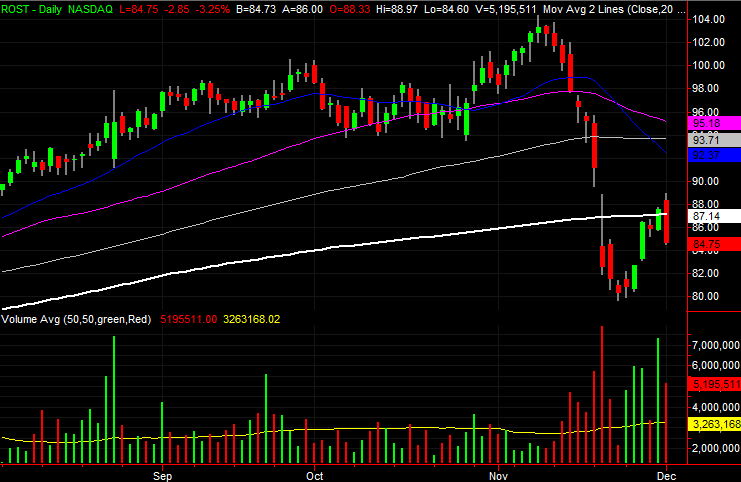 At the other end of the spectrum was the 7.8% setback for GlaxoSmithKline (NYSE:GSK). It’s buying Tesaro (NASDAQ:TSRO) to the tune of $5.1 billion, which some investors argue may be too much. None of those names are solid setups headed into Tuesday’s trading, but the stock charts of Morgan Stanley (NYSE:MS), Ross Stores (NASDAQ:ROST) and Dominion Energy (NYSE:D) are worth a closer look. Morgan Stanley was one of the stock charts in focus a couple of weeks ago, when MS stock peeled back from a familiar, established technical ceiling. The stock’s still not up and over that ceiling. 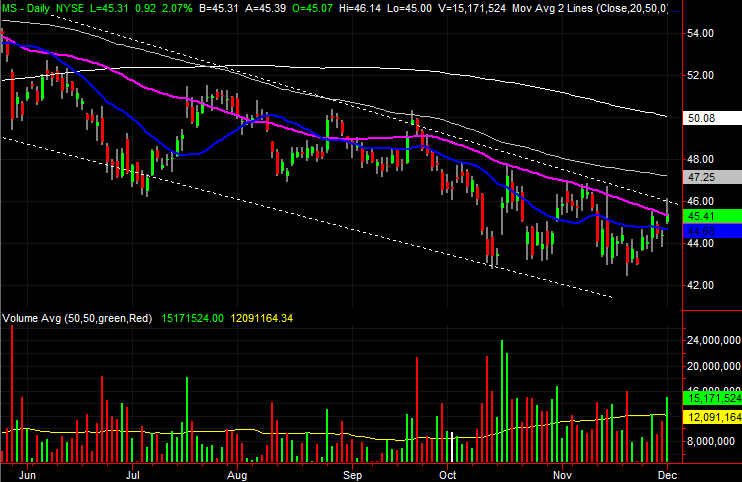 In fact, it’s still technically trapped in the downtrend framed by that falling resistance level. The effort to clear that resistance, however, is worth a closer look thanks to Monday’s action. Click to Enlarge • Yesterday, MS bumped into the upper edge of its falling trading range, framed by white dashed lines. 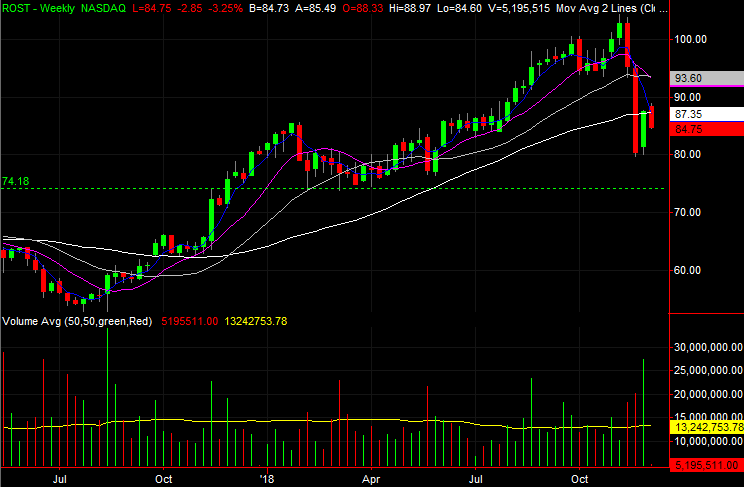 The stock didn’t clear it, and the purple 50-day moving average line appears to be a problem too. • Though Morgan Stanley shares are struggling to break out of a bearish rut, Monday’s sizeable gain took shape on high volume, suggesting there are willing buyers out there. 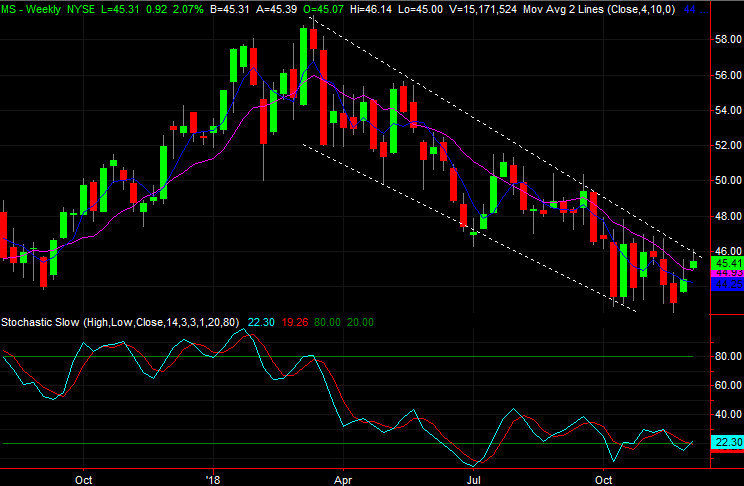 • The weekly chart has been in an oversold condition for months. 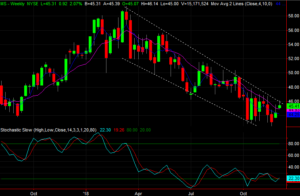 It’s in this timeframe we can see a breakout move that could set the stage for a fairly big recovery. 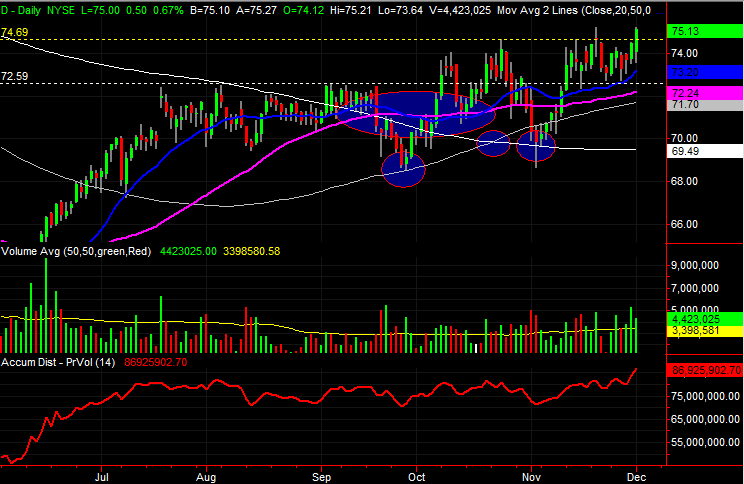 Dominion Energy is another name that’s been in focus recently. Back on Oct. 25 we pointed out several horizontal resistance lines that were being knocked over, along with several moving average lines acting as support. The stock stumbled in the meantime, sliding all the way back to its white 200-day moving average line in early November. 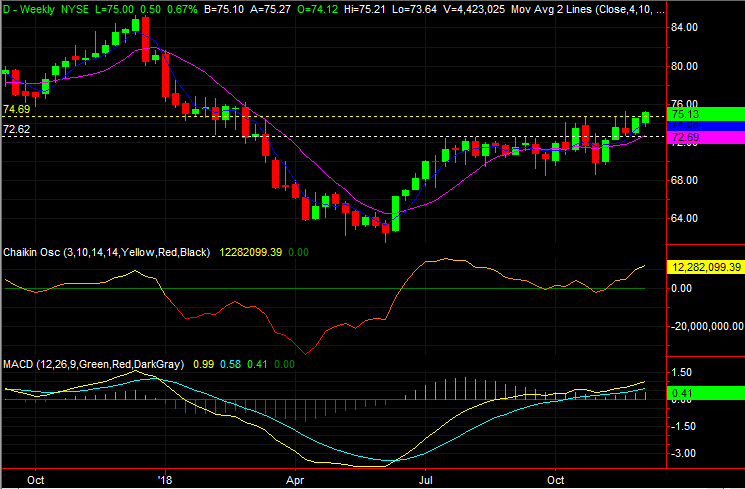 The bounce was almost perfect though, pushing D all the way back up to a previously established range. Monday’s modest strength was enough to get Dominion all the way over a huge hump. 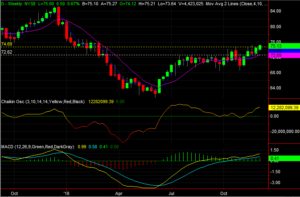 Click to Enlarge • The hump in question is the $74.69 level, plotted with a yellow dashed line. Yesterday’s close of $75.13 was the first close above that level in months. • Better still, the buyers are finally starting to show up. 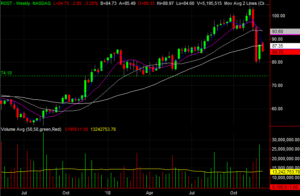 The daily chart’s volume bars as well as its accumulation-distribution line shows more and more buying on the way up. • The weekly chart of Dominion Energy puts it all in perspective. The pattern has some of the qualities of a cup-and-handle setup, which means this bullish move should be built to last. Finally, as of the end of last week, Ross Stores shares looked like they were in recovery mode. ROST stock was hammered in the previous week before and after earnings. But, the sellers looked like they overshot. Yesterday’s action, however, sends a bearish message to the market again. Though the bears need to follow-through just to put an exclamation point on that message, the stage is set for another wave of trouble. Click to Enlarge • The key is the shape and placement of Monday’s bar. The open was above Friday’s high, and the close was below Friday’s open. This ‘engulfing’ bar shows a sharp, deep change of heart. • The reversal move also dragged ROST back below the pivotal 200-day moving average line, plotted in white on both stock charts of ROST stock. • The bears will need to lead Ross Stores shares to a lower low sooner than later for the pattern to go somewhere, but if it does, the next most likely landing point is the early 2018 bottom around $74.20. Article printed from InvestorPlace Media, https://investorplace.com/2018/12/3-big-stock-charts-for-tuesday-morgan-stanley-ross-stores-and-dominion-energy/.